We didn’t think these words would ever come out of our mouths but…we’re officially sick of pizza. That’s what not one, but TWO pizza nights in the matter of days will do to you. But what else were we to do when faced with a long weekend and a new pizza stone? Now for the break down of all the necessary pizza night components: dough, a few words on technique and of course – toppings! Don’t be intimidated by making your own dough – we promise, it requires the same amount of time and energy as buying a pre-made bundle from your local pizza shop or grocery store. various toppings (see our creations below), olive oil, salt & pepper, cornmeal and extra AP flour for rolling. The procedure is the same for both doughs. Gather the ingredients together and mix and/or knead together until a smooth ball is formed. Have flour handy to use as needed to prevent sticking when kneading by hand. Loosely cover the dough (with plastic wrap or kitchen towel) and allow to rise for at least 30 minutes. For a thick crust allow the dough to rise another 30-60 minutes. We managed to snag a few pizza baking tips from the most recent issue of Bon Appetit that appropriately features a D.I.Y. pizza party (seeing that we had already begun preparations for our pizza making extravaganza when we received our copies we couldn’t help but feel a little ahead of the curve). Preheat the oven to its highest setting, or 500 degrees. 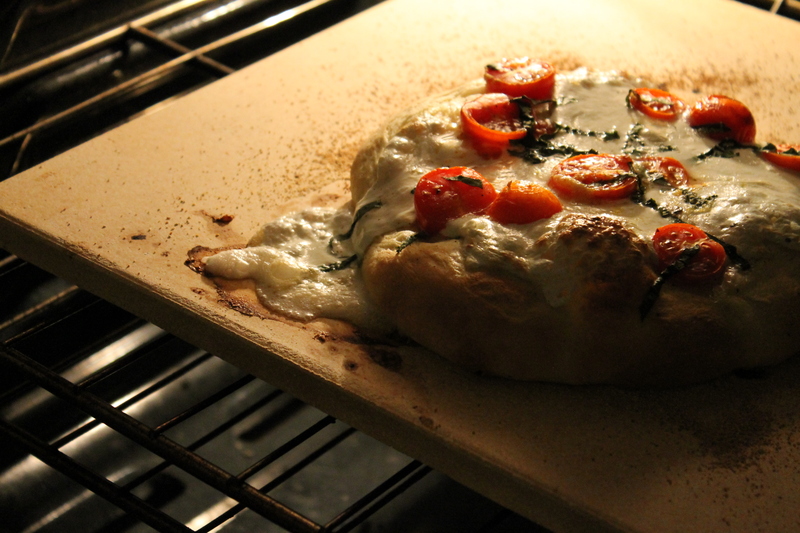 If you are using a pizza stone position it in the top third of the oven when you preheat. Using a baking sheet is also completely acceptable – no need to preheat that however. Portion the dough (we got 4 – approximately 10″ pizzas out of each dough recipe). When you’re ready to assemble and bake, roll out the dough into a roughly 10″ circle. Place a good sprinkle of cornmeal on a baking sheet and place the rolled out dough on top. Drizzle olive oil on the dough and then go crazy with toppings! Inspired by Motorino’s recipe, this was exceptional — shredded brussels sprouts, crisp pancetta, fresh ricotta, parmesan, and a sprinkling of shredded mozzarella. Our take on the classic white pizza — fresh ricotta, fresh mozzarella, shredded mozzarella, parmesan, thinly sliced garlic, red pepper flakes and a drizzle of garlic oil was perhaps the best slice either of us had ever tasted….truly. 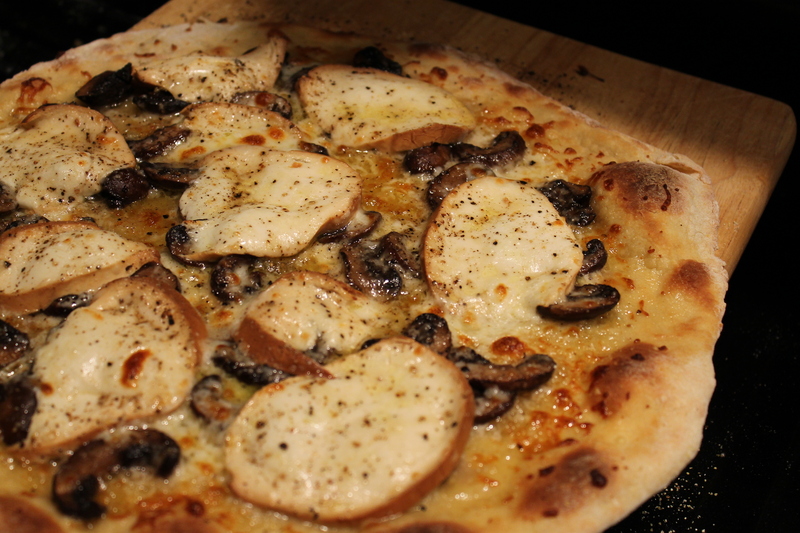 As we dove into this mushroom masterpiece we both wondered why smoked mozzarella isn’t a more prominent pizza topping…sauteed baby bello mushrooms, smoked mozzarella, shredded mozzarella, and a drizzle of truffle oil made for an earthy and delectable pie. Up for something a little different? 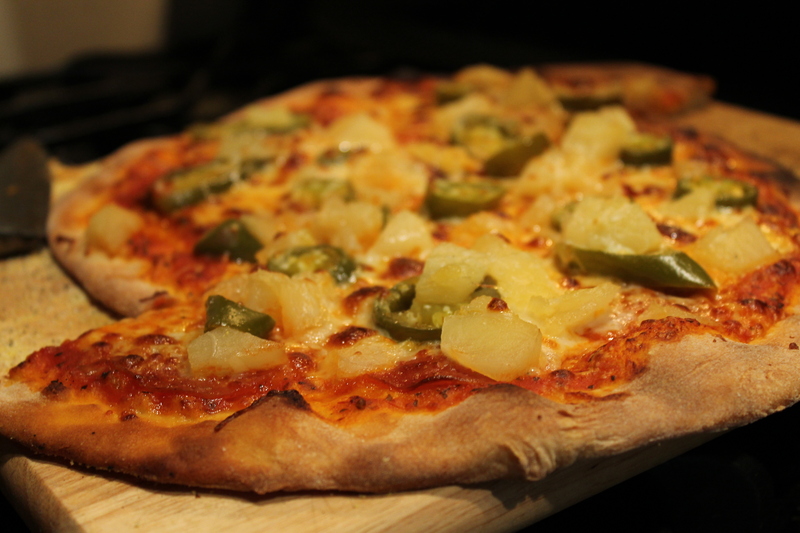 Try this sweet and spicy combo: classic pizza sauce, shredded mozzarella, pineapple, jalapeno and pepperoni. A surprisingly delicious pairing. Ready for more? How about tangy and pungent tallegio paired with spicy dried copa — so. much. flavor. And what would a pizza night be without the classic margherita — fresh mozz (and lots of it) basil, and cherry tomatoes on a thick crust. Once you’ve topped your dough with plenty of fixin’s season it with salt and pepper and increase the oven to broil. Slide the pizza onto the pizza stone (or place the baking sheet in the oven) and you’ll have a hot n’bubbly pizza in about 5-7 minutes. Any way you slice it (or top it!) 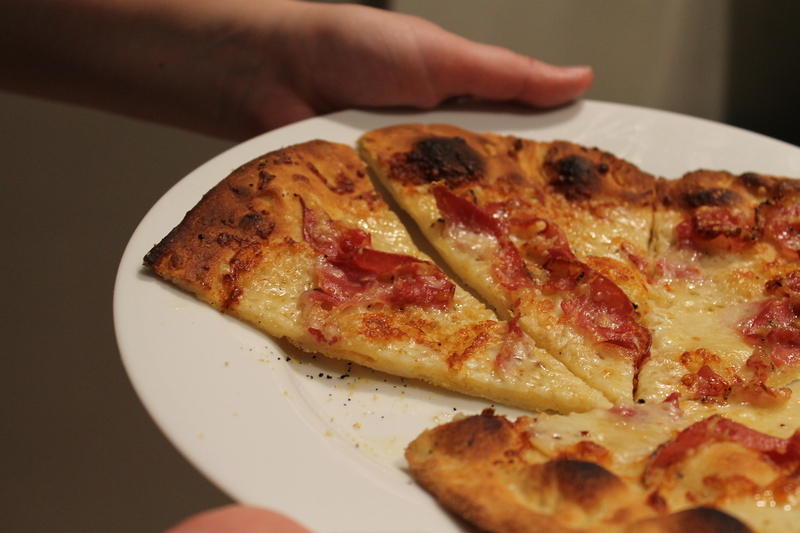 pizza night is both fun and incredibly delicious for all. So come on now, and get yourself a pizz-a the action! This entry was posted in Bread, Pizza, etc., Brussels Sprouts, Mushrooms and tagged bake, brussels sprouts, cheese, dinner, dough, fun, pepperoni, pizza, pizza party, pizza stone, toppings. Bookmark the permalink.